What would be the best transportation to take from Disney Hollywood Hotel to YMCA Salisbury in Kowloon? We are a party of four (2 adults, 2 kids). We will be carrying luggages and might find it inconvenient to take the MTR. Is taking a taxi a better option? And if so, how much would be the charge for this? Also, our check out time at the hotel is in the morning but we want to make a side trip to the Citywalk Outlet mall nearby before transferring to YMCA. Would it be possible to leave our luggages somewhere? Any locker facility service that we can avail of in the area? I'm not sure if Hollywood Hotel will allow us to leave our luggage for a couple of hours after checkout. Wow, this advice is exactly what I am looking for! My family and I will be doing it the other way around, we will travel from YMCA Salisbury to HK Disney Hollywood Hotel. I googled how to get there, and this answer came out. Thanks for the advice! Re: Best Transportation to take from HK Disney Hollywood Hotel to YMCA Salisbury in Kowloon. First, bringing along a standard size luggage have no problem on taking MTR trains. It is the most efficient way to travel between the two hotels also with other major places around Hong Kong. But for hassle-free and to avoid long walks, we suggest you take a taxi. Taxi travel time between the two hotels is about 40 minutes @ HK$300. Disney's Hollywood Hotel is one of two hotels at Hong Kong Disneyland Resort situated at Penny's Bay, Lantau Island, Hong Kong. The Salisbury-YMCA of Hong Kong hotel is located at 41 Salisbury Road, Kowloon, Hong Kong. 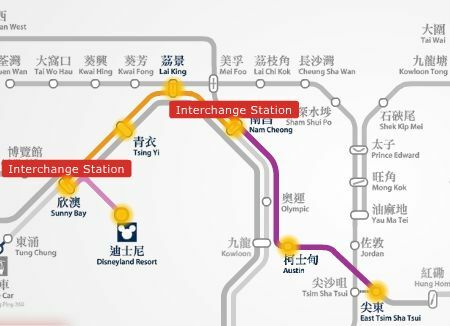 Take the shuttle bus from Hollywood hotel to the Disneyland Resort MTR station (the shuttle bus stop is very close to the MTR station - to your left if coming from exit of the MTR). Leaving your things on other places aside from your hotel is not recommended. It should be ok to leave your things in your hotel (you need to verify this with your hotel). I think your referring to the Citygate Outlet shopping mall at MTR Tung Chung station, exit C as it this place is close to Disneyland. But just in case, there are also storage lockers available for rental at Citygate Outlets. Big size storage lockers has a dimension of 22 X 31 X 35 inch (LWH) that cost HK$20 per two hours and, small size storage lockers has a dimension of 15 X 31 X 15 inch (LWH) that cost HK$10 per two hours.